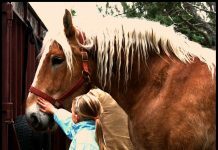 Patriotic horse lovers can celebrate two of America’s original breeds over the next two weeks at the National Appaloosa Show and World Championship Appaloosa Youth Show, and the American Paint Horse Association Youth World Championships. Both shows take place through July 6 in Forth Worth, Texas. 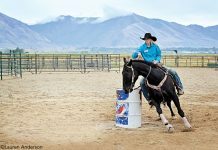 Horse-against-horse speed classes (Appaloosa): These include Camas Prairie stump race (barrel racing), Nez Perce stake race (pole bending), and rope race (similar to musical chairs). Instead of racing against the clock, as is done in other horse breeds, Appaloosas race head-to-head. Champion of Champions class (Paint): This competition will bring back first-place winners in horsemanship and equitation classes to compete against one another. Each participant creates their own pattern and they are encouraged to incorporate music. Wednesday July 3rd at 3:30 p.m.
riders mounted on horses controlled by attendants. Heritage (Appaloosa): This is a costume class in which contestants display authentic apparel and trappings appropriate to early-day users of Appaloosas-Native Americans, mountain men, etc. Judging Contest: Paint and Appaloosa youth competitors can compete for individuals and team awards in two age divisions (13 & Under and 14-19). Boot Camp: Youth exhibitors can receive hands-on instruction from industry professionals in preparation for their World Show experience. APHA & ApHC Professionals will assist youth participants with feedback and helpful hints for horsemanship, equitation, and showmanship. Space is Limited to the first 25 youth. arena work. This spectator-friendly event will be held June 30 and July 3 in the John Justin Arena. Lots going on in one area. Sounds like alot of fun….and colorful, too.